The Stephanskirche is a church that is located on the eastern most side of the hills of Bamberg. The church belongs to the 17th century with a neo gothic style architecture and obvious baroque elements. 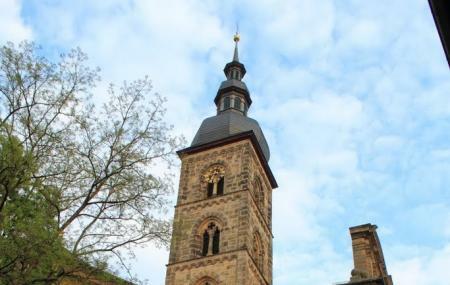 The church is a peaceful getaway from a hectic schedule and is a much recommended visit in the city of Bamberg. The timings refer to the parish office. Mass timings will differ. Train: BTB Tourist Special Train GmbH , Complex Train Ltd.
People normally club together Bamberger Symphoniker and Theater Der Schatten Or Norbert Gotz while planning their visit to Stephanskirche. Ich wurde in Sankt Stephan konfiertmit und hatte bis heute keine Einladung zu irgendwelchen Begegnungen. Ich habe ein Konfirmationbild mit meinen Konfirmanden. Warum ,ich bin Jahrgang 1943, kam nie eine Nachricht. Ich habe in meiner Dokumentenakte mein Heiliges Kreuz und auch meinen Konfirmationspruch.